Evening Loverlies! 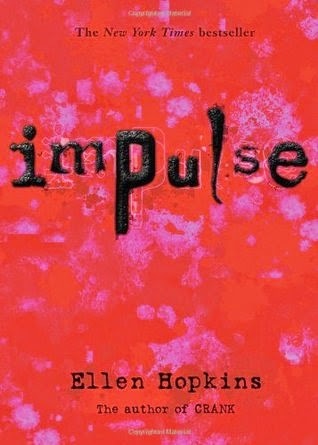 I have always wanted to try one of Ellen Hopkins books, so I decided to try Impulse because I thought it was the first book she wrote. Apparently I must have looked up her books wrong, I found out Crank is actually her first book. I also always seem to never read what the book is about, I guess i'll never learn. This book is very emotional, but describes a good idea of what folks dealing with mental issues go through. It's about these three teens that are in a psychiatric hospital for different issues. I believe it also shows a good point that if you know someone who should be taking their medicine and they get off those meds, you should tell someone about it that can help them. Especially if you can tell a difference with their moods. I will admit it was a good book, just a bit on the sad side. I found it easy to read and hard to put down though. I will have to try some more of her books though. :) Have a Blessed Day!